Here is a link to a short 3 minute video of the deities at ISKCON Mayapur, Sri Chandrodhaya Mandir situated in Mayapur, a Village now a town which is about 130 kilometres from Calcutta, West Bengal.Mayapur is the world Head quarters of ISKCON. The significance of this place, which is a part of nine Islands called, Navadvip is that, this is the birthplace of Lord Chaitanya Mahaprabhu, who appeared 500 years ago. Lord Chaitanya has come into this world to spread the Holy name, Hare Krishna Mantra which is especially meant for Kali yuga. And, the yuga dharma for this age is the name sankirtana or congregational chanting of the holy name. The form of Lord Chaitanya who is none other than Radha and Krishna combined and taken the form of a devotee and Lord Nityananda who is an associate of Lord Chaitanya is none other than Lord Balaram.It is said that, what ever little devotional activity you perform in Mayapur and Navadvip will give you unlimited spiritual benefits. It is said that here, every word is a song and every step is a dance. Ever since childhood, I have chanted number of mantras. Mantra for Studies, mantra for wealth, mantra for health,debts,to ward off the evil effects of Planets in wrong position etc. They are mantras to please and to appease the demi gods and malefic planets for that period of time. Then, I also meditated on number of Mantras like Om, Soham etc. However, it is only when I started chanting the Hare Krishna Maha Mantra could feel the difference. 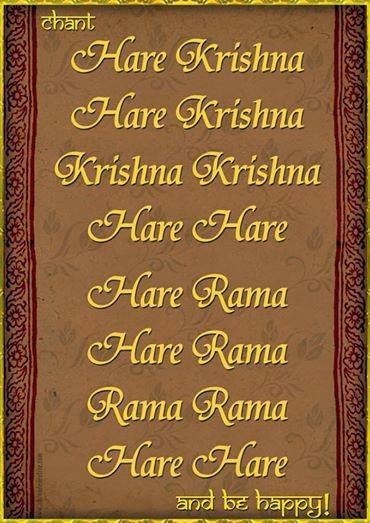 All the Mantras had some effect and worked for specific purpose but, from my experience I could say that there is no mantra that is so sublime and special like Hare Krishna Maha Mantra. In this article, we see what is so special about, Hare Krishna Mantra and what it can do to us. The following story from Vaisnava tradition illustrates the incomparable value of Krishna's holy name. Once a disciple asked his guru for the topmost secret of bhajana. The guru replied, "The most confidential secret of bhajana is to always chant the maha-mantra- Hare Krishna Hare Krishna Krishna Krishna Hare Hare, Hare Rama Hare Rama Rama Rama Hare Hare!". After leaving his guru's asrama, the disciple met some poor washer-men who were chanting Hare Krishna while scrubbing clothes beside the Yamuna. He then heard some little girls chanting Hare Krishna while collecting cow dung. When the disciple hired a ricksaw, the skinny old driver chanted Hare Krishna all the way back to the asrama. Meeting his guru, the disciple expressed a doubt about the maha-mantra, "Gurudeva! What kind of secret have you given to me that is known to every dhobi, ricksaw walla and little girl in India? Is this really the most confidential secret of bhajana?' Instead of a long explanation, the guru handed the disciple a precious jewel and said, "Show this jewel to the dhobi, rickshaw walla and little girls, and see if they appreciate its value." The disciple then showed the priceless jewel to the illiterate washer-men, but they could not detect the value of the jewel. They said they would gladly accept it, and use it for beating their dirty cloth. The disciple refused to give them the gem, saying, "You have to pay the proper price for it. A stone or piece of wood is sufficient for beating dirty cloth." Upon seeing the jewel, the rickshaw walla said, "Since it is a little rough, I think it is just suitable for scrapping off the dry skin from my feet." "Are you crazy!" said the disciple as he walked on to show the village girls. Failing to recognize the true worth of the jewel, the girls said, "We could use the jewel to pack our cow dung." The disciple again met with his guru and said, "Gurudeva! Nobody wanted to pay the proper price for the jewel. Nor could anyone appreciate the great value of the gem." "Yes, in the same way," said the guru, "most people cannot appreciate the value of the holy name. For this reason, they are indifferent to the chanting of Hare Krishna. The Hare Krishna maha-mantra is an open secret that is revealed only to the qualified." 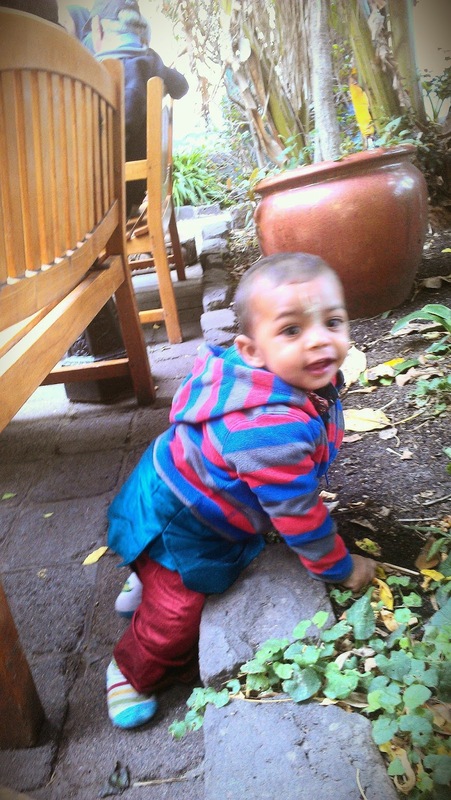 These are the photos of my 14 months old son, who was showing me a lump of mud and he seems to be saying -Try this, see how tasty it is. What do you think he is trying to say? There was a sweet pastime that took place when Lord Chaitanya Mahaprabhu (Nimai) was a small boy.Once Mother Sachi gave a bowl of Fused rice, sweetmeats to little Nimai to eat and went on to do some household work.Then, Nimai hid himself and started eating dirt. Seeing this, mother Saci hastily returned and exclaimed, "What is this! What is this?" She snatched the dirt from the hands of the Lord and inquired why He was eating it. Crying, the child inquired from His mother, "Why are you angry? You have already given me dirt to eat. What is My fault?. 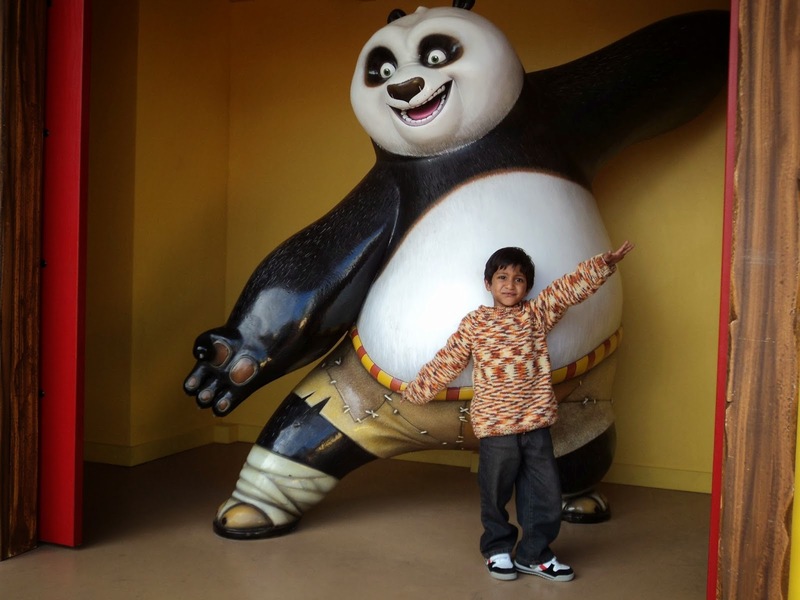 "Fused rice, sweetmeats and all other eatables are but transformations of dirt. This is dirt that is dirt. Please consider. What is the difference between them? This body is a transformation of dirt, and the eatables are also a transformation of dirt. Please reflect upon this. You are blaming me without consideration. What can I say?" "Anyone who engages in spiritual devotional service without motivation, rendering such service for the satisfaction of the Lord, is elevated immediately to the spiritual platform, and all his activities are spiritual." Brahma-bhuyaya refers to Brahman (spiritual) activities. Although Mayavadi philosophers are very eager to merge into the Brahman effulgence, they have no Brahman activities. To a certain extent they recommend Brahman activities, which for them means engagement in studying the Vedanta and Sankhya philosophies, but their interpretations are but dry speculation. Lacking the varieties of spiritual activity, they cannot stay for long on that platform of simply studying Vedanta or Sankhya philosophy. Life is meant for varieties of enjoyment. The living entity is by nature full of an enjoying spirit, as stated in the Vedanta-sutra (1.1.12): ananda-mayo 'bhyasat. In devotional service the activities are variegated and full of enjoyment. As stated in the Bhagavad-gita (9.2), all devotional activities are easy to perform (su-sukham kartum) and are eternal and spiritual (avyayam). Since Mayavadi philosophers cannot understand this, they take it for granted that a devotee's activities (sravanam kirtanam vishnoh smaranam pada-sevanam, etc. [SB 7.5.23]) are all material and are therefore maya. They also consider Krishna's advent in this universe and His activities to be maya. Therefore, because they consider everything maya, they are known as Mayavadis. Actually, any activities performed favorably for the satisfaction of the Lord, under the direction of the spiritual master, are spiritual. But for a person to disregard the order of the spiritual master and act by concoction, accepting his nonsensical activities to be spiritual, is maya. One must achieve the favor of the Supreme Personality of Godhead through the mercy of the spiritual master. Therefore one must first please the spiritual master, and if he is pleased, then we should understand that the Supreme Personality of Godhead is also pleased. But if the spiritual master is displeased by our actions, they are not spiritual. Srila Visvanatha Cakravarti Thakura confirms this: yasya prasadad bhagavat-prasado yasyaprasadan na gatih kuto 'pi **. Activities that please the spiritual master must be considered spiritual, and they should be accepted as satisfying to the Lord. 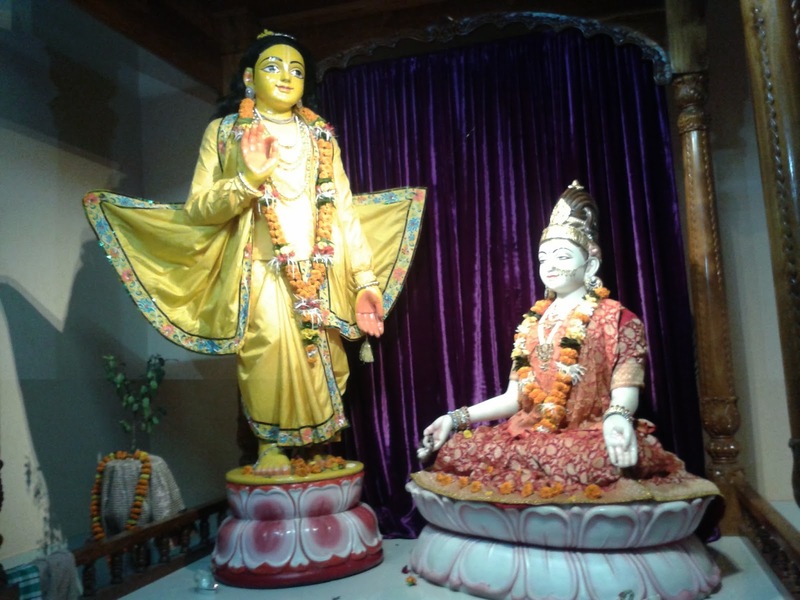 Lord Caitanya Mahaprabhu, as the supreme spiritual master, instructed His mother about the Mayavada philosophy. By saying that the body is dirt and eatables are also dirt, He implied that everything is maya. This is Mayavada philosophy. The philosophy of the Mayavadis is defective because it maintains that everything is maya but the nonsense they speak. While saying that everything is maya, the Mayavadi philosopher loses the opportunity of devotional service, and therefore his life is doomed. Sri Caitanya Mahaprabhu therefore advised mayavadi-bhashya sunile haya sarva-nasa (Cc. Madhya 6.169). If one accepts the Mayavada philosophy, his advancement is doomed forever. 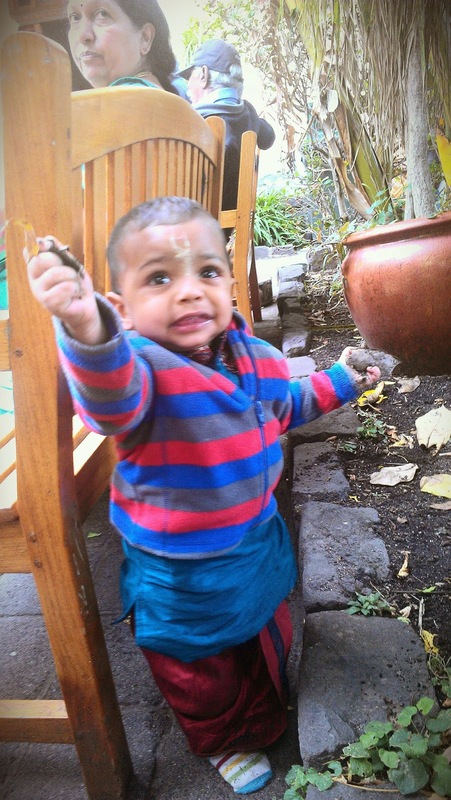 Astonished that the child was speaking Mayavada philosophy, mother Saci replied, "Who has taught You this philosophical speculation that justifies eating dirt?". Replying to the Mayavada idea of the child philosopher, mother Saci said, "My dear boy, if we eat earth transformed into grain, our body is nourished, and it becomes strong. But if we eat dirt in its crude state, the body becomes diseased instead of nourished, and thus it is destroyed. In the philosophical discourse between the mother and the son, when the son said that everything is one, as impersonalists say, the mother replied, "If everything is one, why do people in general not eat dirt but eat the food grains produced from the dirt?" In a waterpot, which is a transformation of dirt, I can bring water very easily. But if I poured water on a lump of dirt, the lump would soak up the water, and my labor would be useless." This simple philosophy propounded by Sacimata, can defeat the Mayavadi philosophers who speculate on oneness. The defect of Mayavada philosophy is that it does not accept the variety that is useful for practical purposes. Sacimata gave the example that although an earthen pot and a lump of dirt are basically one, for practical purposes the waterpot is useful whereas the lump of dirt is useless. Sometimes scientists argue that matter and spirit are one, with no difference between them. Factually, in a higher sense, there is no difference between matter and spirit, but one should have the practical knowledge that matter, being an inferior state of existence, is useless for our spiritual, blissful life, whereas spirit, being a finer state, is full of bliss. In this connection the Bhagavatam gives the example that dirt and fire are practically one and the same. From the earth grow trees, and from their wood come fire and smoke. Nevertheless, for heat we can utilize the fire but not the earth, smoke or wood. Therefore, for the ultimate realization of the goal of life, we are concerned with the fire of the spirit, not the dull wood or earth of matter. The Lord replied to His mother, "Why did you conceal self-realization by not teaching me this practical philosophy in the beginning? Now that I can understand this philosophy, no more shall I eat dirt. If from the beginning of life one is taught the Vaishnava philosophy of duality or variety, the monistic philosophy will not bother him very much. In reality, everything is an emanation from the supreme source (janmady asya yatah [SB 1.1.1]). The original energy is exhibited in varieties, exactly as the sunshine, the original energy emanating from the sun, exhibits itself in variety as light and heat. One cannot say that light is heat or that heat is light, yet one cannot separate one from the other. Therefore Lord Caitanya Mahaprabhu's philosophy is acintya-bhedabheda, inconceivable non-separation and distinction. Although there is an affinity between the two physical manifestations light and heat, there is also a difference between them. Similarly, although the whole cosmic manifestation is the Lord's energy, the energy is nevertheless exhibited in varieties of manifestations. In this world, everyone is trying to become powerful. They are trying to become strong by various ways and means. For example, a businessman gets his strength from prosperity of his business and growing his assets, A intellectual gets his strength by gaining more knowledge etc. So, basically there are three types of strength - The physical, Mental and Spiritual. The physical strength which includes bodybuilding, fitness, stamina which can go off in a moment i,e if the person gets a disease, becomes sick etc. The mental strength is considered superior to the physical because, even though a person becomes sick, he can sustain for a considerable period of time by his mental strength. Actually a person who might be weak physically, but with a strong mind can either cause a greater harm or good to the society by his actions. But, even this has limitations and can go off in a moment. What if the mentally strong person gets into some unfortunate situations like, relationship problems that can be sustained to only certain threshold. The third strength - Spiritual is the most powerful and superior the physical and mental strengths. Because, here the finite or Atomic Soul is connecting and deriving the strength from the infinitely powerful God, the Supreme Person called as Bhagavan.Bhaga actually means six kinds of opulences in full: the richest, the most powerful, the wisest, the most beautiful, and the most influential, and the most renounced at the same time. Personally, I get lot of inspiration and strength by trying to connect myself to the Supreme God, through prayers and chanting of Hare Krishna Mantra and from reading these amazing verses and pastimes from Srimad Bhagavatham and Bhagavadgita. Infact, this source of strength was nicely explained by Prahlad Maharaj in Srimad Bhagavatham to his most powerful, demoniac father Hiranyakasipu who was considered to be the greatest, most powerful demon, who tried to kill the little five year old boy with all the possible means like, throwing him from the top of a mountain, into the fire, locking him in a room with poisonous snakes, trampled by elephants, thrown into a boiling oil etc and all his attempts resulted in total failure.He could not kill the small boy by any of the means he adopted. Prahlada Maharaja said: My dear King, the source of my strength, of which you are asking, is also the source of yours. Indeed, the original source of all kinds of strength is one. He is not only your strength or mine, but the only strength for everyone. Without Him, no one can get any strength. Whether moving or not moving, superior or inferior, everyone, including Lord Brahma, is controlled by the strength of the Supreme Personality of Godhead. The Supreme Personality of Godhead, who is the supreme controller and time factor, is the power of the senses, the power of the mind, the power of the body, and the vital force of the senses. His influence is unlimited. He is the best of all living entities, the controller of the three modes of material nature. By His own power, He creates this cosmic manifestation, maintains it and annihilates it also. (Srimad Bhagavatam,Canto 7: The Science of God,Chapter 8: Lord Nrisimhadeva Slays the King of the Demons, Verse 7 & 8 Translation by Srila Prabhupad)." So many times people get confused about life and about wrong things happening to them or to their dear ones.Some people blame god by saying words like "In any event, destiny is supreme.Whatever has been ordained by the supreme power will come to pass.What can our efforts do to avert it?. "Also, sometimes people new to eastern philosophy or Hinduism which advocates in Karma, reincarnation etc. think that the philosophy is fatalistic. Even the people, who are actually following this path are sometimes confused and declare it so.We see this actually adopted by some people, who refuse to take a action when confounded by a difficult situation. But, the Holy scriptures of India declare this- Fate is surely all-powerful, but we nevertheless receive the results of our own acts. We have free will. The supreme power simply reciprocates with our desires. It is the consequences of our acts which are inevitable, not the acts themselves. You have a choice of making and taking a decision in life, for example in this photo, I was trying to cross a muddy and slippery patch of road, using my LML Vespa scooter, way back in an Indian village. I was lucky and was able to cross without slipping and falling into the muddy waters. Otherwise, my scooter tyres would have skidded, myself including the scooter would have been struck in mud and so on. So, basically here I had a choice in acting in certain way but, the result was not in my hand. In Chapter 5 of Srimad Bhagavad Gita, this point is further clearly explained. The living being desires a certain way and acts accordingly as per his will, the material nature provides a medium for the actions to be carried out and the Lord, as a Supersoul allows and sanctions the desire to be fulfilled. But, the Supreme Lord becoming completely neutral is never responsible for the actions and reactions of a particular situation that are desired by the Soul.The Supersoul being Omnipotent fulfills the desires of a Soul based on what one deserves. Just like the saying, 'Man proposes and God disposes’. God does not interfere with the desires of minute living entity either good or bad. So, there is karma, fate, the Circumstances, the Star or Horoscope etc. But, it is not all black and white or completely fixed in particular way. Of course, there are things like Birth, death, disease and old age that no one can escape but, a person's fate, destiny is not static but, dynamic, ever changing basing on the actions and decisions we take in life. As promised, I have updated the photograph below. Not far from Iskcon campus at Mayapur West Bengal India, there is an Island called Simantadvipa. This island Simantadvipa was also known as Simuliya-grama is located south of the Ganga.We took a taxi and it took us about 30 mins to reach this place.This island represents the devotional process of Sravanam which refers to Hearing the Supreme Lord’s pastimes. This island is famous for Jagannatha Mandir, where the beautiful deities of Lord Jagannatha, Baladeva and Subhdra are worshiped. Today, the place is known as Rajapur.Sri Navadvipa-dhama Mahatmya describes how the Lord Jagannath left Puri and came here after killing the Raktabahu demon. It is also states that this area is non-different from Jagannatha Puri as Lord Jagannatha is eternally resident here. Thus the same benefits of going to Jagannatha Puri are gained by visiting this place.There are lots of pastimes associated with Deities and the temple is currently under ISKCON. we went there in the evening and attended a nice evening arti. There is a temple of Parvati called Simantini Devi temple (just behind Lord Jagannath temple).It is described in Sri Navadvipa Dham Mahatmya,that during Satya Yuga, Parvati came to this Island and chanted the holy names of Gauranga with love and devotion. Within few days, she had the darshan of Lord Chaitanya and received blessing from the Lord. Parvati Devi took the dust from the lotus feet of Lord Gauranga and very eagerly placed it on her head in the Simanta (the middle portion of the hair just above the forehead of ladies is known as Sinthi or Simanta). There is also a Shiva Linga, under a tree who is said to be the Keshtrapal or the protector of the Dham.